But not everyone was happy with Coke’s celebration of diversity in the country. After the ad was aired, Twitter lit up with commentary under various hashtags (such as #SpeakAmerican) critical of the company. Some commenters found it disrespectful to sing “America the Beautiful” in any language other than English, while others said immigrants need to learn English to live in the United States. So how linguistically diverse is the United States? Data from the 2011 American Community Survey (ACS) show that 21% of Americans age five or older speak a language other than English at home. Among this group, a majority say they speak English “very well” (58%), and 19% say they speak English “well.” Roughly one-in-seven (15%) of those who speak a language other than English at home say they do not speak English well, and 7% report having no English language skill at all. Other than English, the language most commonly spoken by Americans is Spanish. 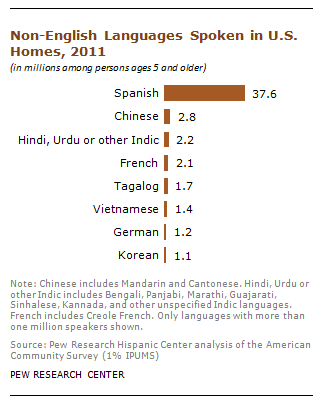 ACS data show that 37.6 million Americans age five or older speak Spanish in their home. Other languages, including ones highlighted by the Coke commercial, have a much more limited presence. Chinese is spoken by 2.8 million Americans, Tagalog by 1.7 million Americans and Korean by 1.1 million Americans age five or older. The eight languages shown in the accompanying chart account for 83% of those Americans who speak a language other than English at home. In all, there are 381 languages spoken in the U.S. that are counted by the Census Bureau, and detailed information is available for 106 of them.